Months ago, I eagerly asked my dad what he wanted me to bake for his birthday. 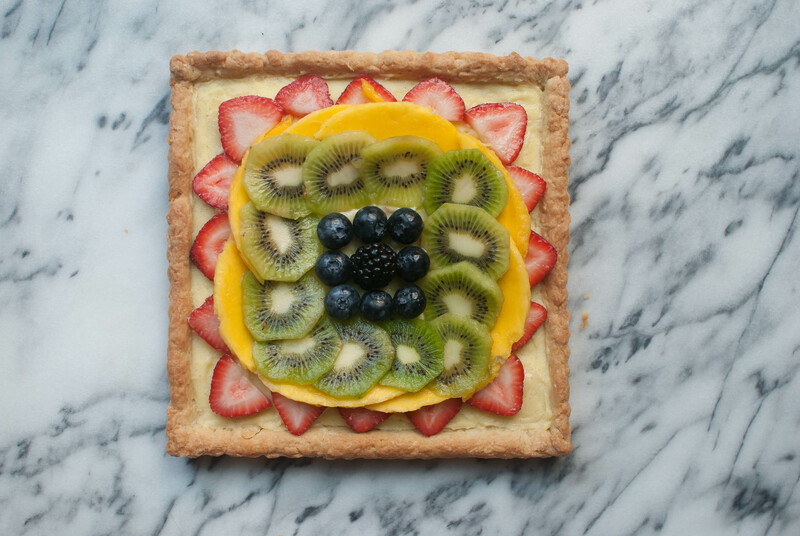 His definitive response was a mixed fruit tart, specifically one with that distinct glaze pastry shops use to make the fruit shine. 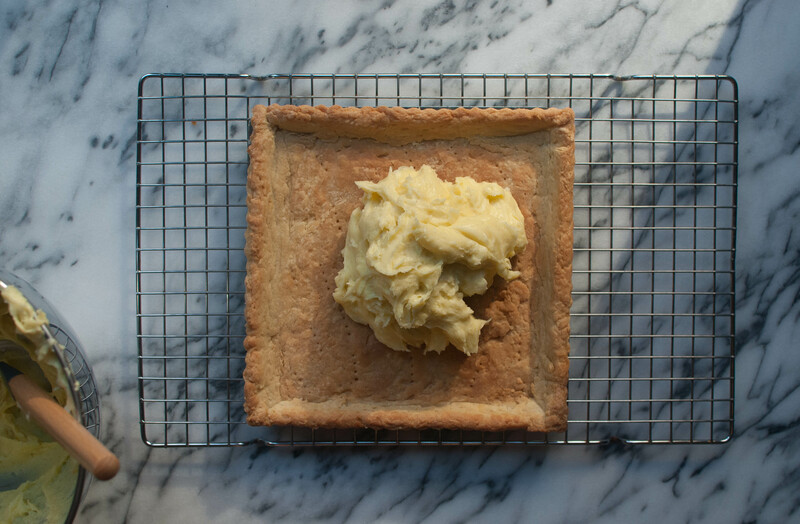 So last weekend, I set out to finally make this beautiful dessert, scouring every source known to man in the hopes of finding the best possible combination of pastry cream (aka the stuff dreams are made of) and flaky, buttery crust (aka the other stuff dreams are made of). But I did end up with a bit. A small bit, but a bit nonetheless. 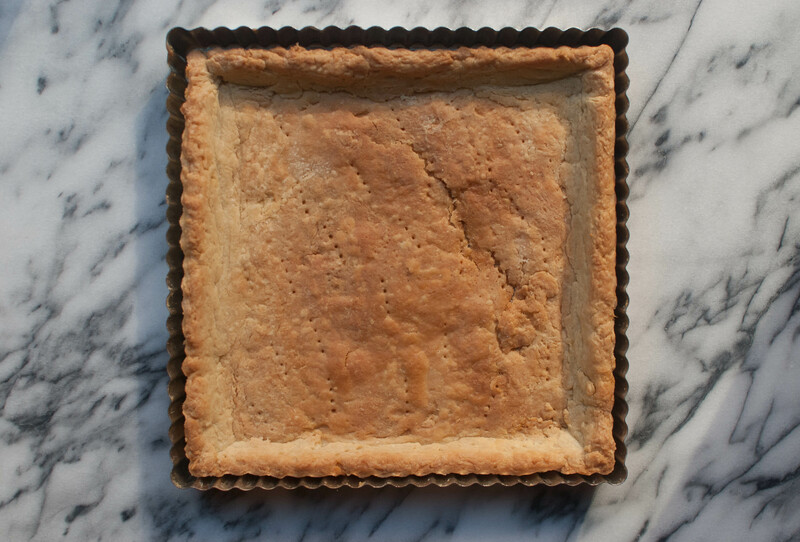 Anywho, the flavor of the tart shell was to die for (and the recipe magically requires no pie weights!) 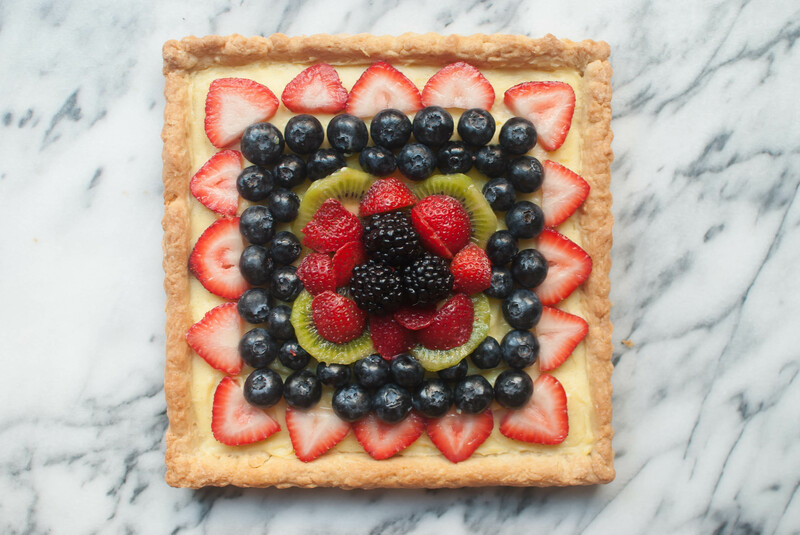 and I have to say, I think that after the 3 fruit arrangements I auditioned the tart looked gorgeous. Start with the dough: In a large bowl or the bowl of a food processor, whisk or pulse together some flour, sugar and salt. 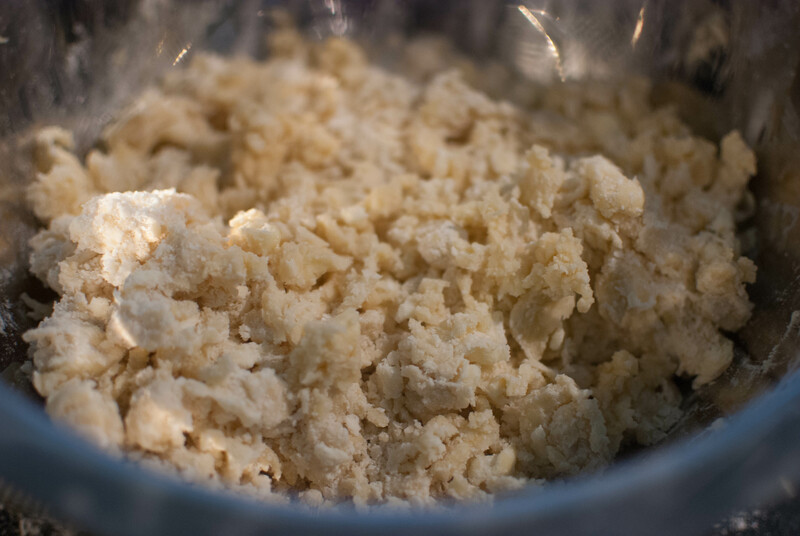 Use a pastry blender, your fingertips or the food processor to cut in some cubes of cold butter until the mixture resembles coarse crumbs, like this. Stir in a beaten egg until the dough forms some clumps, then turn it out onto a floured surface and gently press it into a ball. Wrap with plastic wrap and throw it in the fridge for at least 2 hours. Go for a walk! Have some lunch! Read a book! Or make pastry cream! To do this, I just brought half a split and scraped vanilla bean and some milk to a boil, turned off the heat, and covered the pan for 10 minutes. Then, in another pot or saucepan, combine egg yolks, sugar and cornstarch and whisk until they get nice and pale. Like this! While you’re whisking, gradually add in about 1/4 of the hot milk, then pour in the rest and whisk it all together. Discard the vanilla bean pod and vigorously whisk the mixture over medium heat until it comes to a boil. Continue to whisk until the mixture is nice and thick, like pudding. Remove it from the heat and pour it into a heatproof bowl. After a few minutes of cooling, just stir in some buttah and put it in the fridge! When it’s time to move on with the tart shell, roll the dough out on a floured piece of parchment to a 12 inch round if you’re using a 9 inch tart pan (I actually multiplied the recipe by 1.5 to fit a 9 inch square pan). Transfer the dough to a buttered pan and trim the overhang to 1/2 an inch. Fold the overhang in to make thicker sides and pierce all over with a fork. Place this in the freezer for at least 30 minutes. To bake the shell, tightly wrap the pan in foil that’s been buttered on the shiny side, then pop it into a 375 F oven for 20-25 minutes. Remove the crust, take off the foil and use the back of a spoon to press down any puffy areas. Return this to the oven for another 10-15 minutes, or until the crust is a nice golden brown. Brown = flavor! Yum! See, I’d be totally cool stopping right here. 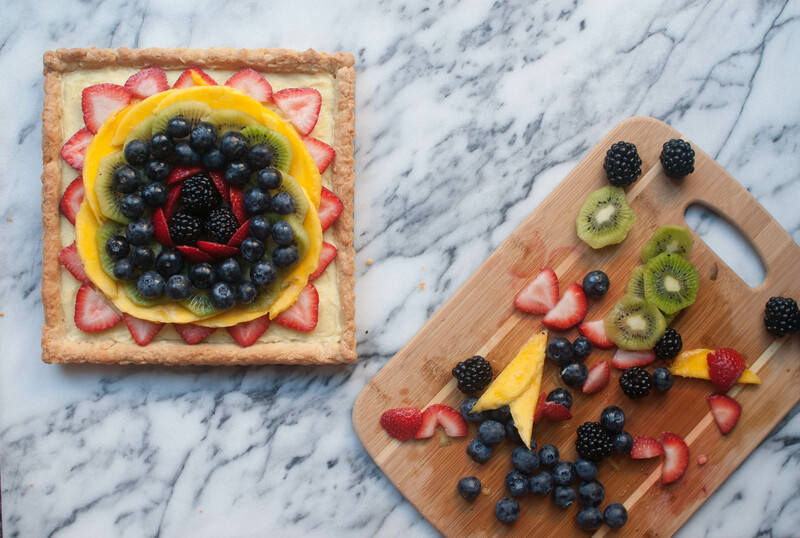 I could eat tart crust all day every day. 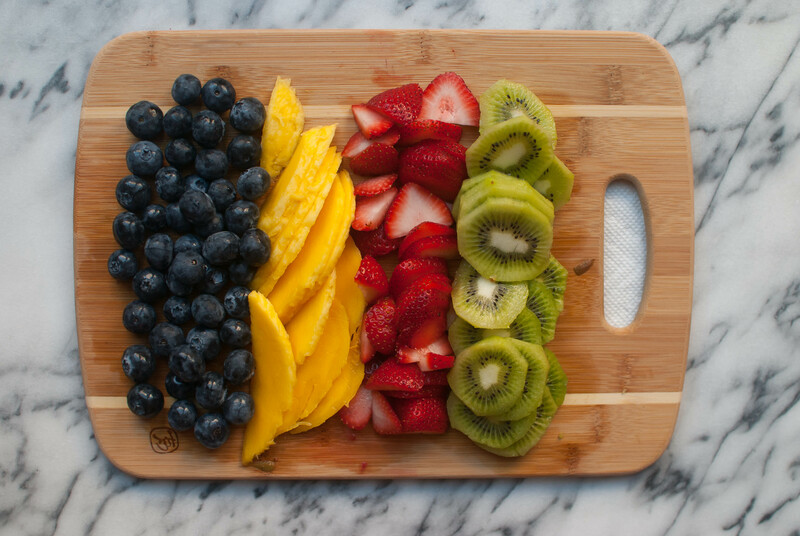 But then we’d never get to use this beautiful fruit! This, my friends, is why I love summer and its produce. The colors are so gorgeous and bright! Use anything you want or have on hand. 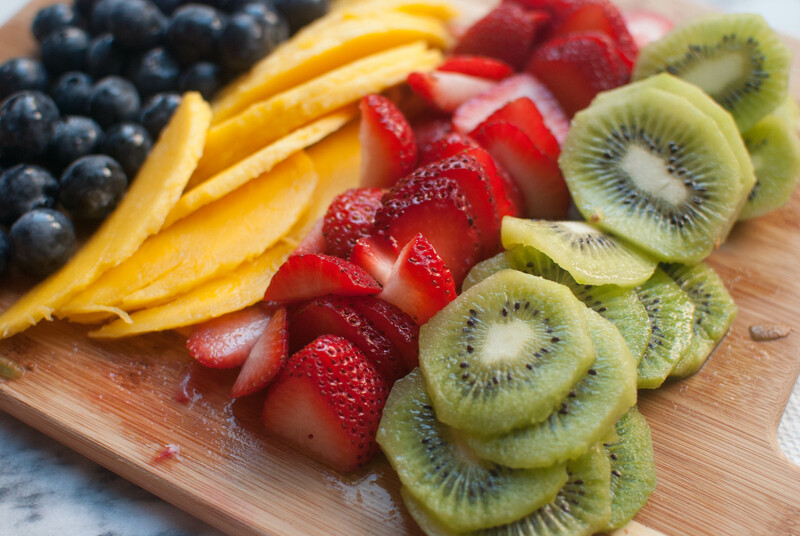 Berries, mango, kiwi–anything goes! Alrighty, let’s do this thang. 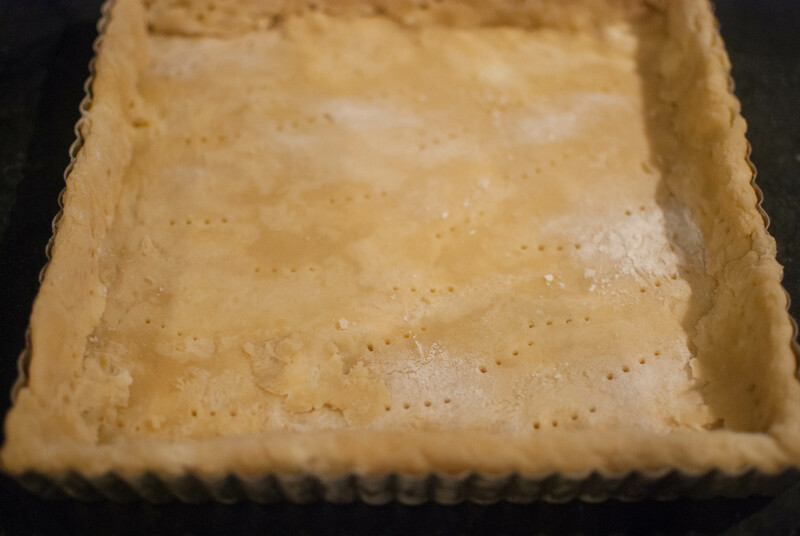 Once your crust is cooled and your pastry cream is set, plop some of that cream right on down. I actually ended up whipping my chilled pastry cream in my stand mixer for a few seconds just to make it spreadable again. Now here comes the moment of truth: How will you lay your fruit? I started like this. But I felt like this tart was capable of bigger and better things. So then I turned to this, but everything was just too boxed up and, well, boring. So I settled on this! Which one was your favorite? After this, I just brushed on some of that shiny glaze. Just apricot preserves and water! This recipe’s a keeper, my friends. Give it a go this weekend! 1. 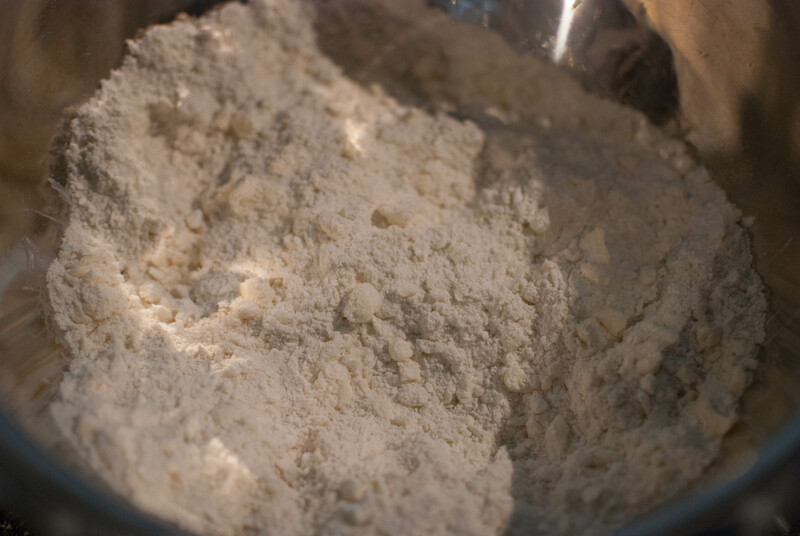 Start with the dough: In a large bowl or the bowl of a food processor, whisk or pulse together flour, sugar and salt. Use a pastry blender, your fingertips or the food processor to cut in cubes of cold butter until the mixture resembles coarse crumbs. Stir in the beaten egg until the dough forms some clumps, then turn it out onto a floured surface and gently press it into a ball. Wrap with plastic wrap and throw it in the fridge for at least 2 hours. 2. Meanwhile, make the pastry cream: In a medium saucepan, bring vanilla bean and milk to a boil, then turn off the heat `and cover the pan for 10 minutes. 3. In another pot or saucepan, combine egg yolks, sugar and cornstarch and whisk until they get nice and pale. While you’re whisking, gradually add in about 1/4 of the hot milk, then pour in the rest and whisk it all together. Discard the vanilla bean pod and vigorously whisk the mixture over medium heat until it comes to a boil. 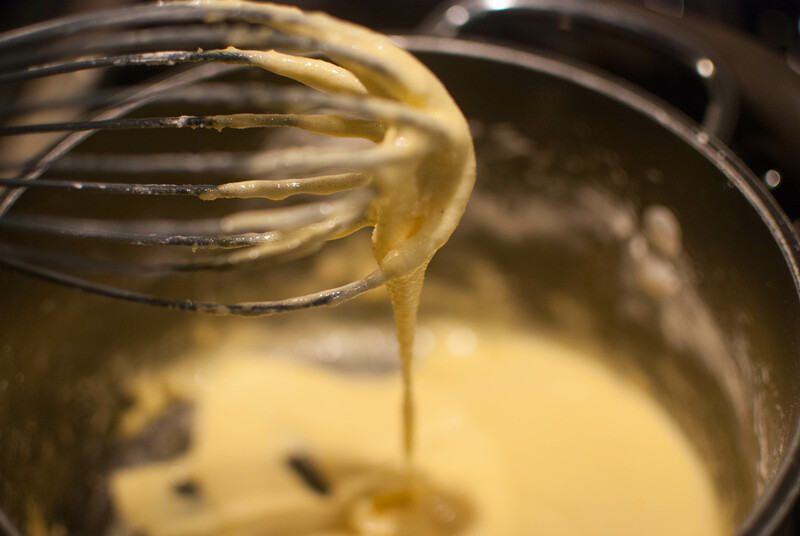 Continue to whisk until the mixture is nice and thick, like pudding. Remove it from the heat and pour it into a heatproof bowl. After a few minutes of cooling, stir in the softened butter, press a piece of plastic wrap to the top and place in the fridge to chill until set. 4. When you’re ready to move on with the tart shell, butter a 9 inch tart pan and roll the dough out on a floured piece of parchment to a 12 inch round. Transfer the dough to the buttered pan and trim the overhang to 1/2 an inch. Fold the overhang in to make thicker sides and pierce all over with a fork. Place this in the freezer for at least 30 minutes. Meanwhile, preheat the oven to 375 F.
5. To bake the shell, butter a piece of foil on the shiny side and tightly wrap the pan in the foil buttered side down, then pop it into a 375 F oven for 20-25 minutes. 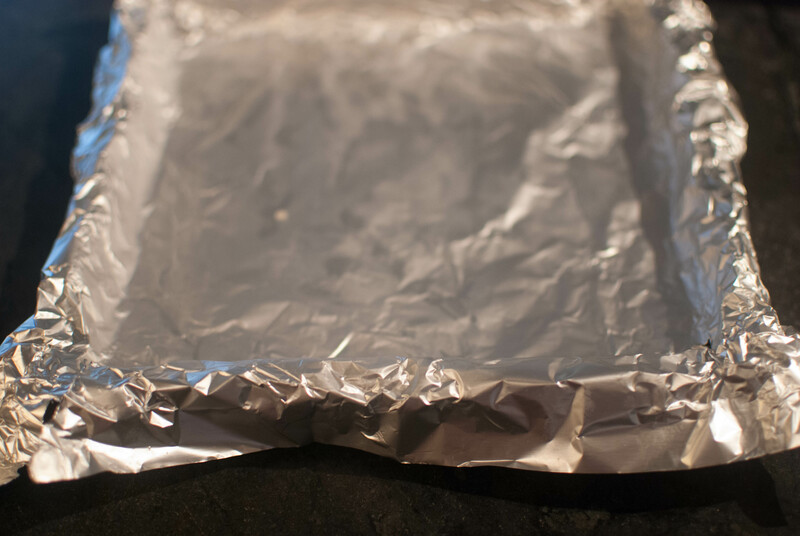 Remove the crust, take off the foil and use the back of a spoon to press down any puffy areas. Return this to the oven for another 10-15 minutes, or until the crust is a nice golden brown. Cool on a wire rack, then remove from the tart pan. 6. 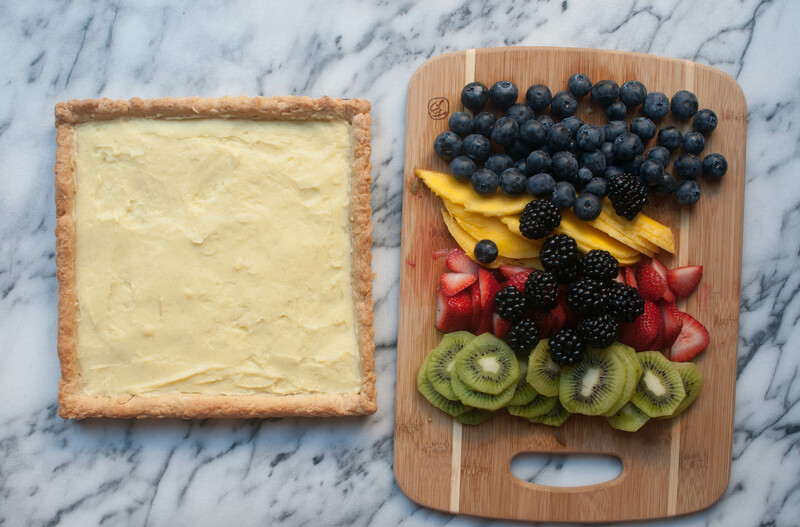 To assemble the tart, spread a layer of pastry cream into the cooled tart shell and top with the fruit. 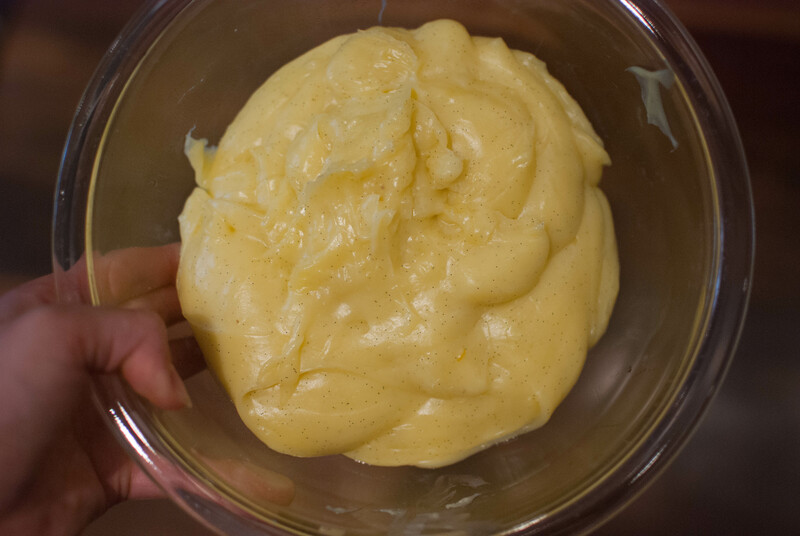 If your cream is too stiff, just beat it on medium high in a stand mixer for a few seconds and it’ll loosen right up. In a small saucepan, whisk together the apricot preserves and water until smooth and brush on top of the fruit. Happy weekend, and happy nibbling!